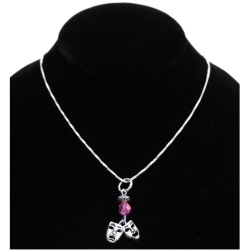 Necklace with an attached comedy and tragedy mask pendant and a pink gem bead. Necklace measures 17" long and pendant is 1" by 3/4". Made of sterling silver.